The Greek historian Herodotus recounts that the great Athenian statesman, legislator and poet, Solon arrived in Sardis the capital of Lydia where he was engaged in conversation by King Croesus. The subject of the exchange was the nature of happiness, and in response to the king’s proud assertion that he (Croesus) was the most fortunate and happiest man alive, Solon suggested rivals to the life of great wealth and power offered the general caution ‘Count no man happy until he be dead’. This maxim is later referred to by Aristotle in the course of his own investigation of the nature of happiness as the aim of human life (Nicomachean Ethics Bk I, Ch. 10). What is less often quoted from Herodotus are the terms in which Croesus first addresses Solon: ‘Stranger of Athens, we have heard much of your wisdom (sophie) and of your travels through many lands, from love of knowledge (hos philosopheon) and a wish to see and examine the countries of the world’ (Histories, I. 30). The meeting was legendary but, had it occurred, the date would have been in the middle of the sixth century BCE and Herodotus did not write his account until over a hundred years later. Even so, his reference to Solon as being one of the sages of Greece, and his quotation of the expressions ‘wisdom’ and ‘love of knowledge’ come some fifty years before Plato’s Republic and eighty or so before Aristotle’s Nicomachean Ethics. Herodotus’s account is, therefore, among the earliest uses of the term ‘philosophy’ (philosophia) to refer to the desire for a true understanding of human life. Herodotus also tells us that prior to coming to Sardis, Solon had visited the court of Amasis in Egypt. Amasis is sometimes spoken of as the last of the great Egyptian pharaohs, but from Herodotus’s account he was initially despised because he was not from a distinguished family, and it was only through his wisdom in judgement and action that he won the people over. Evidently practical wisdom was prized among the Egyptians as well as among the Greeks. If you are a man who leads, who controls the affairs of the many, seek out every beneficent deed, that your conduct may be blameless. Great is justice, lasting in effect. … Baseness may seize riches, yet crime never lands its wares; in the end it is justice that lasts; for a man can say: ‘It is my father’s ground’ [it was the property of his father before him]. Speak truth in your house, so that the officials of the country may respect you, for a sovereign’s renown (lies in) straightforwardness; it is the front room of a house that inspires the back room with respect. … Do justice that you may live long. Calm the weeper, do not oppress the widow, do not oust a man from his father’s property … Beware of punishing wrongfully. There is a notable resemblance between these words, from a court official and a king respectively, and the Solomonic wisdom sayings gathered in the Hebrew Bible in the books of Proverbs [of Solomon] Míshlê Shlomoh, (1000-600BCE), and in Ecclesiastes Kohelet (950-350 BCE). Both the Egyptian and Hebrew authors are concerned with the business of social relations, and in particular the behaviour of those in positions of power, and both direct the intended readers to lives of virtue and practical wisdom. As these traditions develop so there is a noticeable shift from justifications that appeal to readers’ self-interest, showing the utility of justice in promoting or protecting this, to reasoning that appeals to the intrinsic merit and beauty of virtue as an attribute of noble character. The Greeks too were aware of this duality of considerations favouring wisdom and virtue, and in the period of Solon and even more in that of Herodotus’s account of his meeting with Croesus it was recognized that in some circumstances these considerations might be in tension. Virtue and advantage in the conduct of life were already matters of serious reflection but they would soon become subjects of disciplined analytical enquiry. The turning point from sage advice to critical investigation came with Socrates and his method of elenchus or dialectical enquiry. So whereas the Egyptians, the Hebrews and the earlier Greeks spoke of justice and listed some of its requirements, Socrates asked the question what is justice and exposed the inadequacy of conventional responses, as for example in the Republic where Plato has him elicit a range of accounts only to demolish them. The technique of disambiguating proposed definitions and challenging them by means of counter examples is central to the Socratic method and its principal effects were negative. It exposed the inadequacy of a series of interlocutors’ ideas, and since the characters were introduced as representatives of recurrent lines of thought, served to refute generally held views. 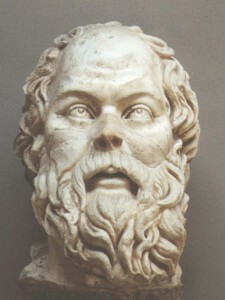 Socrates marks the beginning of practical philosophy: practical in being concerned with questions of what one ought to do as an occupant of some social role, or more generally with how one ought to live as a human being; and philosophy as being engaged in analytically and dialectically with the aim of arriving at some true account of these matters. Plato carries on the same practice while also taking up issues in epistemology and metaphysics, and on that basis his disciple Xenocrates divided philosophical enquiry into three areas: ethics, dialectic and physics or philosophy of nature. It is only with Aristotle, however, that a systematic and reasoned scheme of the division of philosophy is introduced. Again the broad division is into three parts, this time the theoretical (epistêmê), the practical (praxis) and the creative (poiêsis) corresponding to speculative knowledge, conduct, and manufacture or production. These in turn are subdivided with practical philosophy being distributed between ethics, politics and economics – though these fields are not separated by well-defined boundaries. Because comparatively little of Aristotle was directly inherited in the West the favoured scheme of division until the twelfth century was the Platonic one, but with the arrival of texts and commentaries from the Arabic world the Aristotelian scheme was reintroduced into medieval thought as in Thomas Aquinas’s commentary on the Nicomachean Ethics. There he repeats the further Aristotelian point that the principal kinds of philosophical knowledge are specified by their proper objects: the order of nature which speculative reason discerns, the order proper to voluntary actions which practical reason deliberates, and the order created through manufacture which is the business of productive reasoning. Leaving the last to one side we arrive at the distinction between speculative and practical philosophy. Distinguishing these with regard to their goals we may either say with Aristotle that speculative thinking (theôrêtikê dianoia) is concerned with truth and falsity regarding the orders of reality, while practical thinking (praktikê dianoia) is concerned with truth and falsity with respect to action; or else and more familiarly that speculative thinking is aimed at knowing the true, while practical thinking is aimed at achieveing the good. Since practical sciences are distinguished from the speculative in the respect that the speculative are ordained to the knowing of truth while the practical are ordained to a product, it is necessary that this science [politics] be comprised under practical philosophy. Perhaps because of its debt to Aristotle’s analysis and its Latin origins, it is natural to think of the expression ‘practical philosophy’ as being common among medieval and scholastic philosophers; but although the general idea is familiar and generally presupposed the expression itself is rare. Indeed, it first comes to prominence not in the middle ages but in the German Enlightenment. In 1703 the philosopher Christian Wolff completed a doctoral dissertation at the University of Leipzig under the supervision of Ehrenfried Walther von Tschirnhaus. The latter was something of a polymath. For in addition to being a philosopher, he was an original mathematician and the inventor of European porcelain. Perhaps this practical orientation had an influence on his student, but at any rate the title of Wolff’s dissertation was Philosophia practica universalis, methodo mathematica conscripta (On Universal Practical Philosophy, Composed from the Mathematical Method). He sent a copy of this to Leibniz who then also used the expression, as did Kant and subsequent German philosophers including Hegel. Evidently Wolff was enduringly concerned with the practical orientation of philosophy for in his work entitled Logic, or Rational Thoughts on the Powers of the Human Understanding with their Use and Application in the Knowledge and Search of Truth he writes that ‘… a person should learn philosophy …[not with] a view to perceive the vicious taste of the schools for idle disputation and wrangling, but in order to [enjoy its] usefulness in future life’.